In order for this post and semi-rant post to make sense, please watch this clip from Democracy Now, in which the documentary, “Yo Soy El Army: America’s New Military Caste,” a film about the military targeting Latinos, is discussed. You can watch the first part of the clip by clicking here. After you watch the first part, play the video at the top and skip to 3:55 in which the discussion shifts to the DREAM Act being a back door military draft. Do you think there is a chance at getting the Dream Act passed this year? work. The young kids organizing around the country are doing a …fantastic job at exactly what I’m talking about.” Question taken from Latina Mag interview with Dolores. Is the DREAM Act really a back door draft ? Click here to find out what it is. Is it another tool the military is using to target immigrants in the Latino community to join up, be shipped out to war, only to die in the front lines ? Maybe or maybe not. But that’s one of the many questions Dream Team L.A. and The Orange County Dream Team, as part of the the Dream is coming campaign, are going to answer this Thursday evening. Over the last couple of months, within the immigrants rights movements, there has been an internal divide between orgs, groups and individuals pushing for immigration reform this year and passing the DREAM Act as a stand alone bill. This has lead to DREAM Act orgs, groups and individuals being accused of being selfish because we aren’t thinking about our parents. That we are diving up the movement and only causing more problems. That we don’t know what we are doing and only making things worse and that if we do manage to pass the DREAM Act, that it won’t be without a heavy price. Meaning that it would come with attachments like E-verify, more border enforcement, more 287 G programs and SB 1070-like bills. I encourage everyone who has any questions, doubts or wants to find out more about the DREAM Act movement to attend this town hall. Undocumented students have been at the fore front of the DREAM movement these last several months. Doing civil disobedience in Arizona, New York, Los Angeles, Washington D.C. and all over the U.S. If we didn’t believe in the work we are doing, why would sisters and brothers in the movement get themselves arrested knowing that they face deportation ? We do this work because given the current political climate, immigration reform has no chance of passing without being weighted down by grim enforcement policies that would make it a joke and cause severe problems. By passing the DREAM Act first, we are placing a down payment on immigration reform when it is ready to be discussed again after elections. DREAM Act orgs, groups and individuals do this on a strictly grass-roots basis. We get no funding from any one group, org, grant or anything else of that nature. We all do this work of our own accord, while holding down regular jobs, going to school and having regular lives. We don’t make a living organizing like all the major immigrants rights orgs, who do great work, but lose who they are when it comes to money problems. We still have an opportunity to pass the DREAM Act this year, but we need everyone’s help. How can we move forward when the people within our own movement are the ones holding us down ? This entry was posted in culture, Events, Gente, gentrification, Greater Los Angeles, history, Identity, Politica, Rant and tagged dream act, immigration reform by El Random Hero. Bookmark the permalink. As of July 2010 about 485 Latino soldiers died in the Iraq War. 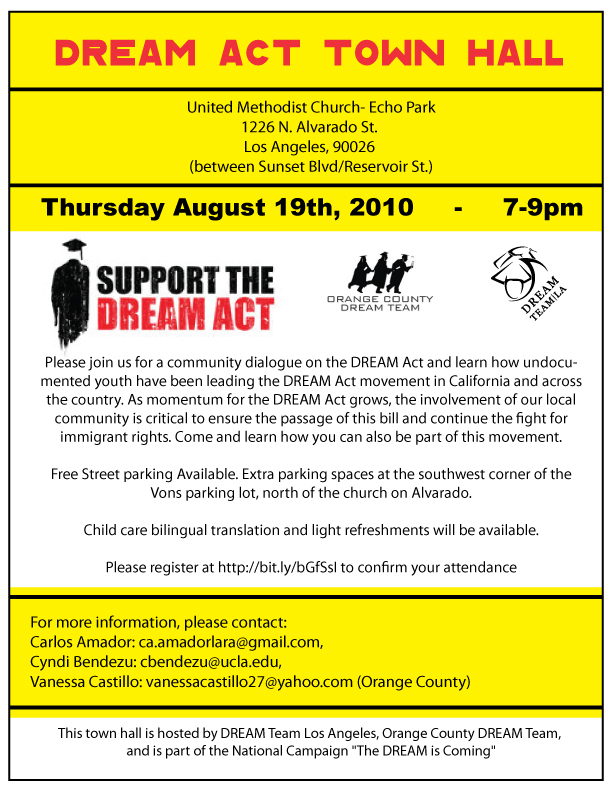 Between January 1st 2007 and August 14th 2010, 1,531 Latinos were killed in Los Angeles County. The common thread is young male, killed by gunfire and gang-affiliation. I’m not so sure that the kind of Latinos that are being targeted by the military are that better off staying here. Some activists have suggested education instead of military, but if you’re not interested in education what then? Most Americans would rather their kids went to school than the military, Spokker, (hence the low military turnout, even in a time of war), but if anyone suggests that young Latinos in violent surroundings go to school instead of the military, they’re “activists”? Of course, but the military isn’t targeting those kids. They are targeting the offspring of parents who have no idea what their children are doing. These kids had parents who were not involved in their education. No, I was talking about specific activists who say those things. There are activists who suggest that poor white kids shouldn’t enlist either. However, in many cases, white, black or Latino, the military is the best option because of poor choices that were made by parents and individuals. The military isn’t going to enlist good Latino students who are on their way to college, but those who didn’t finish high school, whose limited options as a civilian include working in a factory or joining a gang. They can certainly try their hand at community college or a trade school, but if they aren’t interesting in putting their heart into it, what do they do? OK then, so you do know that most Americans believe school is a better option than the military. So, why do you still emphasize “activists” believing it? What’s the significance in what you refer to as activists? Their belief that school is better than the military is quite universal. Not everybody is willing to take school seriously, though. The military remains an option. To answer your other question, there are plenty of activists who espouse beliefs that the majority appear to agree with. Certainly, fondness of the personal automobile is nearly universal in this nation, but there are still highway activists who promote investment in that mode of transportation over all others. Cindy Shehan is definitely an activist, to give another example. Still don’t get your fixation with activism where this topic is concerned, but whatever you say, man.